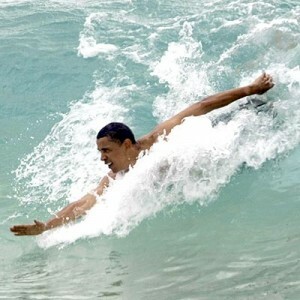 South Bay Bodysurfing–Obama Would Go! Southern California’s amazing monster South Swell two weeks ago brought epic surf to most south facing beaches, but left west facing beach breaks like my home break, Manhattan Beach, with massive close outs if the tide wasn’t perfect. I was lucky enough to catch the tide right for surfing–the Stretch Quad detailed before, on one of the mornings, but the low tide boomers brought me back to my bodysurfing roots. My dad was first and foremost a bodysurfer. He was old school all the way…Never, ever wore fins, and rode in the straight down, one foot up technique pioneered on Venice beach in the ‘40’s. He brought that technique to the South Bay, and I always ride my last wave in, one foot up. Back to the last swell. As you may have read, conditions were heavy and a bodysurfer met his demise at Newport’s Wedge during the swell. I was sitting on the beach checking the surf, when a lone Churchill fin, like the ones we cherished as teens, washed up. It was a left foot large, and while I normally would wear a single right fin, I did what we used to do as a kid, snatched it, put it upside down on my right foot and swam out. It was an amazing session, and I forgot how great it is when it’s just you, a fin and big surf. 10 years ago, my buddy Dave Madden and I caught a similar amazing Manhattan Beach swell, where lifeguards were plucking people out of the water at a rate of 10 per hour….This past swell was right there. Except, this time the lifeguards needed jet skis to keep up. There was just that much water moving. Later that afternoon, knowing the single fin left me undergunned, I made sure I had my seven-year-old pair of yellow Neo Fins. I’ve been through Churchills, Duck Feet—including the really cool natural rubber color, and Vipers, which should be branded Cripplers. What makes the Neo Fins so great is that the foot is actually neoprene attached to a flexible fin blade. They’re super comfortable and work great. I cant seem to find neo Fins online anywhere, but it looks like the Meistrell’s at Body Glove have taken over the brand and are having them made under the Body Glove label. I got some of the best bodysurfing waves in warm South Swell waters that I’ve seen in my life in Manhattan. Another great session, made longer by comfortable equipment. We used to take bodysurfing pretty seriously. As a water polo player at Aviation High School, my team mate Carl Pech, was so committed to Churchiil fins, that he was selling mini aluminum Churchill replicas that we all wore as necklaces—we thought we were pretty badass. We also wore water polo caps on the big days, favoring the orange Beverly Hills High school caps we stole during Pioneer League play in a pool that was under a basketball court that slid off to one end. The BHHS Normans still use that pool. Aside from the mayhem created by last week’s Manhattan open Six Man Volleyball tournament, the Surf Festival always hosts a lifeguard competition, pier to pier (Hermosa to Manhattan) swim and paddle board race (Manhattan to Hermosa pier.) There is also a Saturday morning bodysurfing contest, that brings out the best locals and old timers who travel to one of the sport’s few events. I played in the 6 man this year with my really early childhood chum Derek Levy who reminded me that he had won the bodysurfing contest 10 years ago, with his brother Mark taking second. The Six Man brings out all of the Manhattan old timers and I saw Aviation High star athlete, and wave charger, Steve Lastrappes walking up the beach from the bodysurfing contest. He’s a terrific waterman and has the collection of competitor T-shirts to show for it. The last two weeks, from the swell to the Six Man, to the Surf Festival have made me nostalgic for bodysurfing and living a summer committed to the beach. Bodysurfing and volleyball was just what we did, after we surfed the dawn patrol. We always had some other diversions thrown in, and in 1973, I won the inaugural Surf Festival Skimboard contest, with a handful of 360’s and a handstand…Viva South Bay! Wanted to let you know I came across your site looking for Churchill swim fins. Since arriving on your blog, I came across several posts and I really enjoyed reading them (especially your post about Oahu. When you have the chance, would love you to check out my site Liquid Salt! I think you might enjoy it. Based on design by IAMWW and Upstart Blogger. Copyright © 2009-2010 FOCUS ON THE DONUT. All rights reserved.